For this blogpost, we had to read both a print comic and a digital comic – “Understanding Comics” by Scott McCloud and “Long Term Relationship” by Eroyn Franklin, respectively. Reading both of these made me look at a drastic difference between print comics and digital comics. Scott McCloud mentions how comics are a very old art form, which has been around for quite a while now. But because of the selective interest in people to enjoy a comic, it has always been seen as a fairly new art form. Therefore, digital adaptations seem acceptable because people wouldn’t have to go to a store to purchase a comic and would much rather sit at home and access it with a click. I think the one of the chapters about the panels shows how different a print comic is compared to a digital comic. The concept of closure shows how the reader might already predict a little bit of what is about to happen even before flipping the pages. While ready Eroyn Franklin, I realised this wasn’t true with digital comics just because of how it is represented. Just with a scroll, you can read the whole comic making it strip away the blocks and panels of a stereotypical comic. Although comics don’t have to be written that exact manner, it is definitely a stereotype that defines comics and a stereotype that comic enthusiasts find tough to move away from. I personally also wanted to compare the print versus digital Marvel comics and how it has affected the way I read them. I try to buy the printed copies of the comics whenever possible but sometimes when I cannot, I try to use the digital app to read my comics. The experience with print is the same as reading the “Understanding Comics” – it generates a personal connection, making me excited to know what is to come in the following pages. The same might be true with the digital ones but the way their page layout is created is very different. The digital comics move from one panel to another, making it focus a lot more on the art and words rather than the whole. I think this is the reason why, I would any day buy a print copy of a comic and only settle to reading the digital version when I have no other choice. 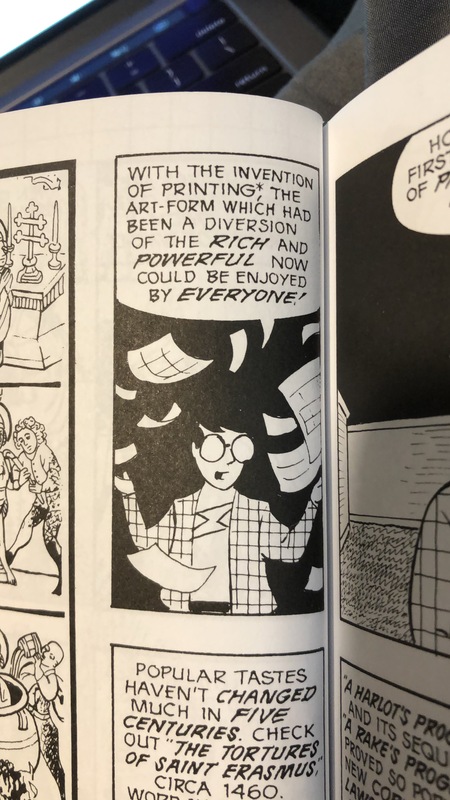 Another key statement I found very interesting in the book by Scott McCloud was the fact that printed copies made comics not just accessible to the elites, but to common people. It is interesting to note how the phase has changed from print being accessible to digital being accessible now. The upcoming generations will never know the personal connection of reading a physical comic and enjoy it the way we did in our childhood.